We exist to inspire our community to work on their stamina, strength or stretch priorities with Yoga and Pilates. Try us now 2 FREE Yoga, Barre or Pilates Mat Classes. Welcome to Soulful Fitness, 2019 Fitness Australia Boutique Business of the Year. Move your body and feed your soul with over 80 blissful experiences a week to help melt away stress and tension, increase strength and happiness and give you a little you time again. May 2019 | Sandra KnightI have seen great benefits I am stronger and more flexible and Yoga helps to relax me. What are your favourite classes? My favourite classes are Hatha and Yin Yoga and Pilates mat. I also enjoyed attending the yoga retreat so much I went back for the second one just a few months later. What benefits have you seen? I have seen great benefits I am stronger and more flexible and Yoga helps to relax me. Challenge that you are working on? I have just completed a 4 day walking tour in Tasmania (Bay of Fires) and was totally amazed by my fitness to complete the walk and enjoyed it very much. I have done the same walk in Melbourne (great Ocean Road) 3 years ago and certainly was not able to walk it all and felt very unfit. Advice for people thinking of starting? My advice would be to take up a Yoga and Pilates and keep going at least 2-3 times a week and you will certainly see the benefits mentally and physically. What made you take on a Pilates and Yoga program? I was involved in a motor accident many years ago that resulted in several surgeries over a 4 month hospital stay, including a total hip replacement. I think one just appreciates one’s health so much more when you are faced with the very real possibility of never walking again, so I have always tried to keep my weight in check and keep up muscle tone to support my damaged skeletal structure. Obviously anything involving impact is out of the question for me, so I always struggled to find something that I could do that would not put me at more risk. 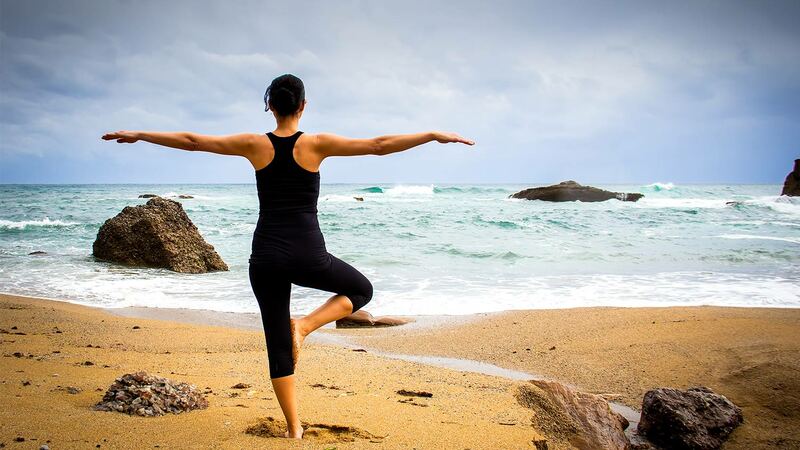 My Osteopath recommended I try Yoga, which was the start of my journey with Soulful, but I have subsequently found that the combination of Pilates, Yoga and Barre is just perfect to cover all the different aspects of my physical health and fitness, and the practice of yoga forces me to check in regularly to make sure I am mentally well-adjusted too. What are your favourite classes? Impossible to choose – we all go through phases, and I find that different classes energise me at different times. And there are always plenty of variations to choose from! What benefits have you seen? I'm fitter, stronger and more flexible than I have ever been! In addition to the physical benefits, attending classes relieves tension and stress, and boosts mental energy. Advice for people thinking of starting? Just do it! Sorry for the free kick for Nike, but it really comes down to not over-thinking the decision and making the commitment. I guarantee you wont regret it! March 2019 | Stephen CooperI have become stronger, more flexible and relaxed. What made you take on a Pilates and Yoga program? I took up yoga after spending some time in Ubud, Bali where I did yoga daily for two weeks. This got me hooked on the benefits of the practice both physical and spiritual. What are your favourite classes? My favourite classes are Hatha and Yin Yoga. What benefits have you seen? I have now been doing yoga regularly for a year and a half and have become stronger, more flexible and relaxed. Challenge that you are working on? The challenge of yoga is to perfect the poses and in doing so your focus is on your breath and body. Advice for people thinking of starting? If you are thinking of starting yoga you have nothing to lose except perhaps weight, stress and worry. What made you take on a Pilates and Yoga program? I joined Soulful fitness about 3 years ago because I wanted to make a positive change in my life after a really stressful life event. I was doing a weekly yoga class and I enjoyed it because I could feel what a fantastic stress release it was, but it wasn’t enough. Soulful offered a membership that allowed me to go as many classes through the week as I wanted and make the most of the yoga and Pilates training. I have been going regularly since then, averaging about 3-4 classes a week, which I find really work in with my schedule. What are your favourite classes? I have three favourite classes for different reasons. I love Sunday 8.30am Pilates with Kathryn – it’s the perfect weekend class with time for a coffee with friends after. Monday 6am yoga with Julio to get focused and ready for the work week, and Friday 6am yoga with Phillipa at the end of the week for stress release and unwinding. What benefits have you seen? The main benefit has been for dealing with stress, but I’ve also noticed toning of my body, increased strength and flexibility and better technique. The teachers are excellent and are great in providing feedback and giving quick tips or a bit of advice on how I can improve my practice. One of the other big benefits has been in meeting local people and making friends in the area. It’s always such a friendly and welcoming place. Challenge that you are working on? I am working on my technique, particularly on strengthening my core and glutes through both Pilates and yoga. I want to be more conscious of my posture so I’m building my core strength to improve it. Advice for people thinking of starting? Just jump in and give it a go. If you commit to starting, you’ll feel the benefits really quickly. It’s often hard work, but it’s worth it. Everyone starts at different levels, and everyone is catered to in the classes. There is never any judgement or criticism and we work at our own pace. Give it a go. Cheryl has been a member for over 3 years and has attended over 400 classes! She has shown amazing dedication to her health and wellness being super consistent over the past few years even while running family and a successful Australian business. What made you take on a Pilates and Yoga program? I’d been practicing yoga for several years but struggled to find a quality studio in my local area. Soulful Fitness provides a wide range of classes and being open 7 days a week provides me with the flexibility I need. Also, the studio is a ten minute walk from my home so it is super convenient. What are your favourite classes? I started with yoga but in the last year or so have added Pilates reformer classes. I try to go 4 times per week. The reformer practice has significantly improved my strength which has also improved my endurance in yoga. I regularly practice with Lauren, Imelda and Amy. Each has their own style and the mix of classes and styles provides a good balance to my week. I’ve also enjoyed practicing with Hayley and Julio and try to squeeze in their classes when I can. I occasionally pop into other classes and find all the teachers and studio staff engaging, enthusiastic and dedicated. What benefits have you seen? An overall improvement in my strength, flexibility and fitness. I always feel better after a class and that keeps me coming back. Challenge that you are working on? I am working on mastering some of the more challenging (trickier) moves in Imelda’s reformer class and finding the time in 2019 to attend one of Julio’s retreats. I will try to make that a priority. Advice for people thinking of starting? Give it a go and stick with it. Every class and teacher is different and the more classes you try the more likely it will be that you’ll find a program that works for you. There is plenty of variety and the studio offers a number of other wellness programs and services to compliment the exercise component. November 2018 | Kylie NeighbourI am calmer, more patient, less anxious and can now take on any challenges thrown my way. What made you take on a Pilates and Yoga program? I joined Soulful Fitness because I was over going to a normal gym. I wanted to lose weight but I just could not stick to going to a normal gym, I lost interest. Pilates and Yoga appealed to me so when I popped in one day just to make an inquiry, after talking to the lovely staff member I joined straight away. That was a few years ago now, the longest I have stuck to anything, except my husband! What are your favorite classes? I attended the last yoga retreat and it was amazing. Lots of yoga, life lessons, nature and the best of all, the lovely people that attended. I will definitely be going again next year. My favorite classes, I would have to say begins with Sunday night Sunset Yin Yoga and Mediation with Julio. I then follow that up with Julio's 6am Hatha Monday morning class. Could not start the work week any better. I have also started Thursday morning Vinyasa Class. I was scared to come as I thought I was not strong enough. Turning into one of my favorite classes. Also up there is Imelda's Tuesday morning Pilates Mat class. So hard but also good at the same time. Each week I get just a little bit stronger. When I first started at Soulful Fitness my goal was just to lose weight. Well that has gone up and down over the years I have been going but I have found my mental health is much improved. I am calmer, more patient, less anxious and can now take on any challenges thrown my way. Challenge that you are working on? Now its time to really get in shape. I am combining my Yoga/Pilates with learning how to run. Half marathon in May next year is on the cards. Advice for people thinking of starting? Don't wait. Sign up, you'll love it. You don't have to be flexible to do yoga, it is so much more than that. What is your number one health, wellness or fitness priority at the moment? Which day suits you best? Morning or afternoon?